Near the southwest corner of the main island of the Chatham group, NZ, is a small flock of feral sheep which appear to have certain Merino characteristics, and thus may predate the Islands change to longwool breeds. 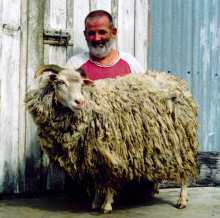 It is believed that Chatham Island ferals have been living wild for almost a hundred years, and it is possible that they originated from some Saxon Merinos that were taken to South East Island (another of the Chatham group) in 1841. The most noticeable difference between these and the feral sheep of Pitt Island is that the Chatham ferals are mostly white-woolled, whereas those on Pitt are mostly colored.